This article is written in response to the article Activism as a blue whale challenge by Manu Joseph that first appeared in Livemint. –Dalit Scholar Rohith Vemula, who was institutionally murdered. Often academic interests die a quiet death due to crassly political reasons but they die yet again, due to non-recognition and to their relentless reduction to the apolitical. Much as there must be emphasis on seeking solutions to the troubles that humanity is facing, it cannot be ignored that reducing the ‘root’ cause of everything to the realm of ‘apolitical’ can be academically simplistic and politically dangerous. And why must there be an obsession with relegating everything to the ‘apolitical’ domain? Why do journalists who continually work within political systems still consider depression to be something external to the sphere of politics? Why must there be academicians who discount historicity and complexity by equating violence with counter violence? And why, similarly, must there be politicians who condemn violence on ‘both sides’? Because, even a simple reading of the political should reveal its association with power, challenge its centralization, and more importantly the show up the invisibilization that generates hegemony. ..The value of a man was reduced to his immediate identity and nearest possibility. To a vote. To a number. To a thing. Never was a man treated as a mind. As a glorious thing made up of star dust. In every field, in studies, in streets, in politics, and in dying and living. ..My birth is my fatal accident. I can never recover from my childhood loneliness. The unappreciated child from my past. The middle of this month would witness a different type of Yatra on the streets of Telangana and Andhra Pradesh. Neither it would be led by high profile leaders – who have the aura of Z plus security with them – nor it would be undertaken in an ultramodern bus – fitted with latest facilities and which could even be used as podium for a public meeting. ABVP ARE THE FOOT-SOLDIERS OF THIS FASCIST GOVERNMENT WHO ORCHESTRATED THE ATTACK ON JNU POST 9TH FEB LAST YEAR! APPEAL TO EVERYONE TO REJECT AND ISOLATE THE KILLERS OF ROHITH AND THOSE WHO ORCHESTRATED THE #SHUTDOWNJNU CAMPAIGN! As JNU is still recovering from the aftershocks of last year sangh parivar’s attack on our university post 9th of February we are again facing an unprecedented attack on our university – its democratic space, progressive admission policy, its inclusive character. The latter has been the heart and soul of JNU which the student movement has built over the last four decades. 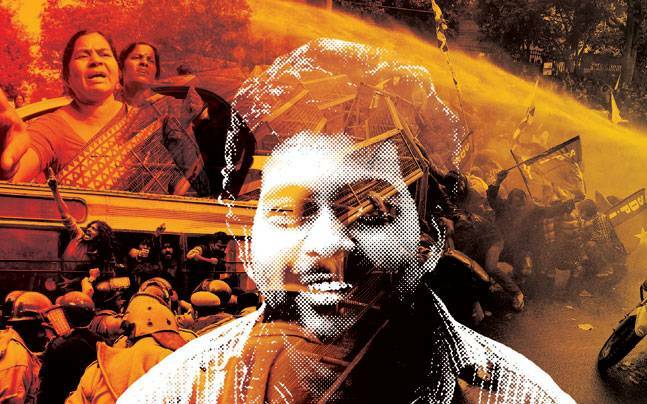 Last year’s attack was an attack on our right to dissent, to curb our democratic spaces and to implement the fascist Hindutva agenda on our universities. This year, in the name of “academic quality” and “excellence”, by reducing the seat intake & closing admission they want to ensure that none is able to access higher education in JNU. In a rare and incredible order today, the Delhi High Court has dismissed the copyright infringement case filed by Oxford University Press, Cambridge University Press and Taylor and Francis (Routledge) against Rameshwari Photocopy Shop in Delhi School of Economics and Delhi University. Justice R.S Endlaw in a 94 pages long judgment interpreted educational exception under section 52(1)(i) of the copyright act in broad enough manner to cover the acts of photocopying.